There is no shortage of suspension design types in the RC world, but for trail trucks and other off-road adventure vehicles, one of the most preferred suspension styles is the link type. Links are typically a long fixed plastic bar or long metal rod with ball-ends on each end that stretch from points on the chassis to the trucks axle. Sounds pretty simple right? There is a bit more to it. There are several link set-up types and Axial vehicles such as the SCX10 and SCX10 II use different type of link setups. There are three different designs used; a 3-Link, 4-Link and a 3-Link with panhard bar setup. Here we’ll go over what each style looks like and their performance attributes. 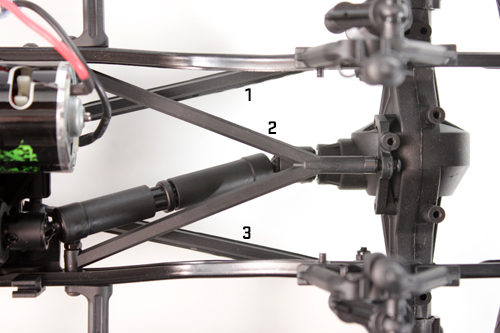 A 3-Link suspension setup can commonly be found on the front of the SCX10 platform. Two lower links, one on each side, span from the skid to the lower axle tubes. The third link is located up higher to secure the axle from rotating. Here an upper Y-link is used for the third link. It mounts to the frame and spans to a single center point/ mount on the top of the axle. 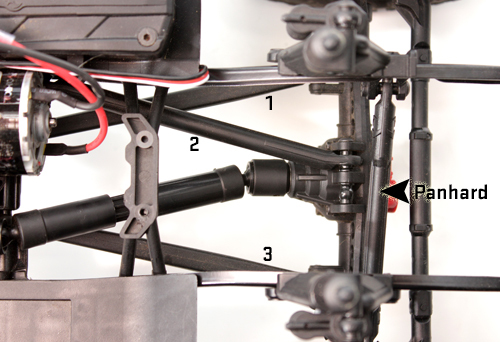 A 3-Link setup rotates the axle around the moving vertical pivot during articulation and can result in some axle sway. The 4-Link design is similar to the 3-Link in regard to how the lower links span from the skid-plate to the axle housings in a triangulated format. However the top link is slightly different. 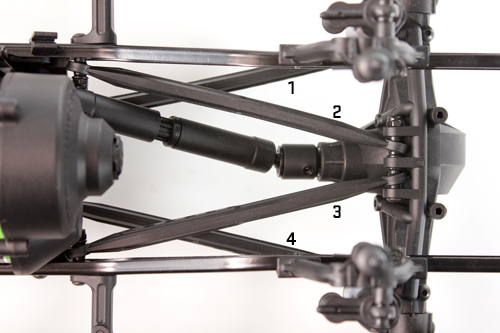 The top utilizes two links that span from the inner frame to two pivot points on the top of the axle in the center. The 4-Link suspension design moves in a much linear path than the 3-Link and results in less axle sway, steer and reduces the effects of torque twist. Now, are you ready for the description of a 3-Link with panhard bar? Brace yourselves, it’s actually made up of 4-Links. It’s similar to a “4-Link design” but with one upper link purposely missing. So if you’re one of those people who have opened your kit and said to yourself; Hey a link is missing, it’s not supposed to be there. To prevent the axle from shifting in this style of suspension design, a “panhard” bar is used; the fourth link. A panhard bar runs from the frame perpendicular to the other links and mates up with a mounting boss on the axle carrier. This suspension setup offers smooth linear articulation without the axle sway associated with a 3-Link system. Although we’ve discussed the different type of link designs in a simple format, there is a bit more to it such as anti-squat, roll center, anti-dive and other tuning options that further differentiate each, but that is for another discussion. The style of links found on your specific SCX10 model are there by design to deliver articulation for optimum performance.